This post is a continuation of Molara’s Lebanon travel story. I would suggest that you read the first blog post here, which details out Day 1 in Beirut. As a recap, Molara Brown of Travelkotroom is sharing all about her 6 days and 11 cities trip to Lebanon. The first post was about Beirut and this will be about the other exploits. 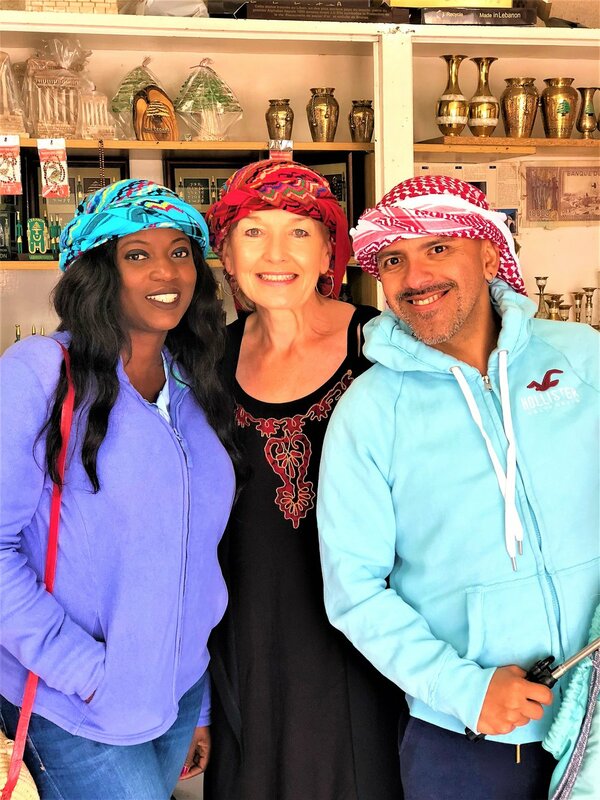 I took a 2hours road trip from Beirut to Bsharri (Bcharre) town with my tour guide and another tourist, Bernie from Ireland who currently lives in Abu Dhabi. This was the only tour I pre-booked before landing in Lebanon. My tour guide, Robin, happened to be a Nigerian of Lebanese origin. He grew up and lived in Niger State until his last visit to Lebanon where he made up his mind to make the country home. First stop was the Deir Mar Antonios Qozhaya (St Anthony of Quzhayya) situated along the Kadisha Valley. The Maronite hermitage founded in the 11th century is the largest in the valley and is famous for establishing the first known printing press in the Middle East in the 16th century. We hiked the Cedars of God in the cold, the weather was 14°, at some point it rained. I got to hug the oldest cedar which is said to be over 6000 years old. We visited the Khalil Gibran Museum because Bernie is a fan but unfortunately the Museum is not open on Mondays. We drove down the Qadisha Valley, a UNESCO World Heritage site, to get to another maronite monastery. The valley which is home to a number of monasteries and cave churches was the refuge destination for fleeing maronite monks. For this tour, I paid $80. I took a service (pronounced “servees’), shared taxi from my airbnb bus stop to Cola intersection . My destination for the day was the city of Sidon, known locally as ‘‘Sayda’’, which is around 45mins from Beirut. I teamed up with a British tourist who was on the bus with me to Sidon. We explored the Sidon Sea Castle together, actually we basically just took pictures and left. The entrance fee to the Sidon Sea Castle which was built a fortress of the holy land is 4,000 LBP. It is a beautiful structure but there is no guide to tell you anything. The security guy only collects your money and sends you in to get lost. It is however a beautiful destination for pictures. Afterwards, we hopped on a bus to Tyre which is locally known as Sour. The ride was two hours long. In Tyre, we got to explore the Tyre Hippodrome and Al-Bass Necropolis, a UNESCO World Heritage site. We entered this structure from the end of the street and did not get to pay any entrance fee but apparently there is another entrance where you pay 6,000 LBP. We also got to explore the Narrow streets of Tyre’s Christian Quarter. I moved to a different city on my fourth day in Lebanon. I got on a bus heading towards Tripoli from the Charles Helou bus station, this was the closest station to my Airbnb. I got down at the Ajaltoun exit, from where I took a cab to Jeita Grotto. Jeita Grotto, believed to be the longest cave in the Middle East, consists of two separate but interconnected limestone caves. This was one of the best views of Lebanon and must not be missed. There is a ‘No photography’ rule enforced at the Grotto, all phones, cameras are dropped in lockers at the point of entry. To my amazement, I met a bunch of Egyptians in the upper grotto who had sneaked a camera in. Shocked doesn’t cut it. Well, I told them to take of picture of me, which was later sent to me via WhatsApp. I kept gasping in awe at the sight because the grotto is truly beautiful. We got on a cable car from the entrance to access the upper Grotto. A colorful train took us to the entrance of the lower grotto. A tour of the lower grotto involves the use the of an electric boat trip. My cab driver dropped me at Jounieh from where I took the cable car, locally known as Téléphérique, to see the statue of Our Lady of Lebanon. I could literally see the insides of people’s home from the cable car. The car stopped for a few minutes and I honestly didn’t even realise there was a power cut, it was on my way back down that I realised, Lebanon “Nepa” carried light while I was hanging in the air. Hahaha!. The Stature of Our Lady of Lebanon, which was crafted in Lyons-France, is a 13-ton statue, made of bronze and painted white honouring the Virgin Mary perched on top of a hill, overlooking Jounieh Bey. I headed to my new home in Halat which is a one bedroom and parlor self contain apartment overlooking a public beach. I basically was in the house to sleep and wake up (typical bed and breakfast) as I was out of the apartment by 5AM the next morning. The Baalbek ruins was my best experience followed by Jeita Grotto. This is another guided tour I decided to join at the last minute. Robin came to pick me at the new apartment and we drove to Beirut to get the others. This time, my tour buddies were a British Couple, Bernie from the Qadisha Valley Tour and a Peruvian with the Canadian Permanent Residency. The journey from Beirut to Baalbek took us over 2 hours. The Roman Ruins of Baalbek is located at the edge of Lebanon’s troubled region, the beqaa valley and just miles away from the Syrian border. Important to note that Baalbek is an important stronghold of the Shi'a Hezbollah movement. This is one region, that I won’t advise anyone visits solo, at least visit with a local if you can’t afford a guided tour. We all had our international passports with us for identification, but at no point were we asked to show our IDs. Our first stop in Baalbek was the Roman limestone quarry not far from the ruins which is also known as Stone of the Pregnant Woman. It is believed that any woman who touches the stone will experience increased fertility. The story of the preservation of the quarry by a local man who has a shop right opposite the quarry. He spent years unveiling a treasure while people believe he had embarked on a futile journey. The Ruins are the most impressive and magnificent structure in Lebanon or maybe I should just say the best I saw. The ruins consists of three temples: The temple of Jupiter is the principal temple of the triad, the exceptional and best preserved temple of Bacchus and the temple of Venus also called the round temple is the smallest of the triad. In Baalbek, I also saw the most beautiful mosque ever. The exterior is the mosque was so shiny and beautiful. Robin informed us that the mosque is now occupied by the Hezbollah military, so we could not explore it or openly take pictures. I recently found out that the structure is known as The shrine of Sayyida Khawla, which was built during the period of the Roman rule. From Baalbek, we drove along the Beqaa valley passing several refugee camps of displaced people from Syria to Anjar. Anjar is actually closer to the Syrian border than Baalbek. The Anti-Lebanon mountain ranges serve as backdrop to the quaint city of Anjar. The Anti-Lebanon Mountains are mountain range that forms most of the border between Syria and Lebanon. Prior to the civil war in Syria, Anjar was a major tourist attraction. The UNESCO World Heritage Site is best known for the large number of Armenians who reside in the city and of the Umayyad ruins. Even though the ruins is not as impressive as the Baalbek ruins, the anti-Lebanon backdrop gives it an aesthetic feel. 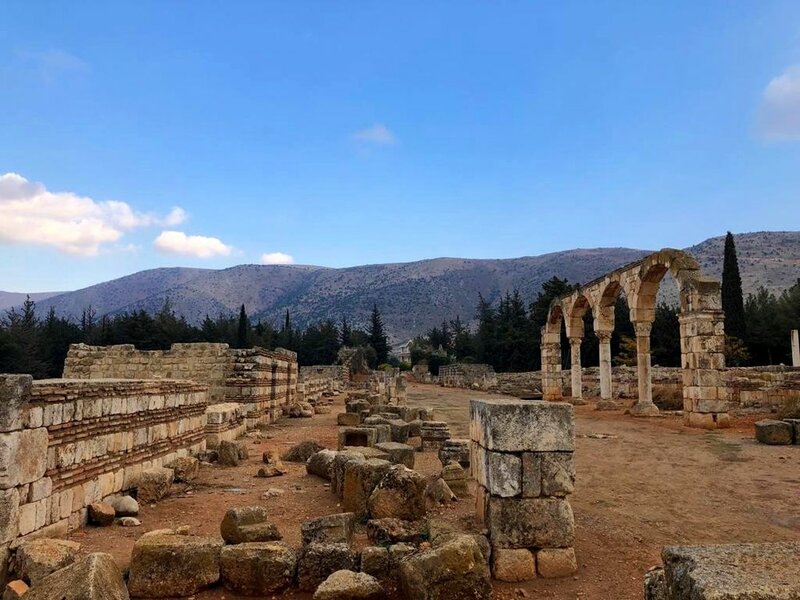 The ruins of Anjar include the walls of the Umayyad palace, harems, a mosque, the palace of the Caliph, thermal baths, and many pillars which include some elements of the Roman architectural style. We rounded up our tour for the day with a tour of Château Ksara, the oldest winery in Lebanon established by Jesuit priests in 1857. 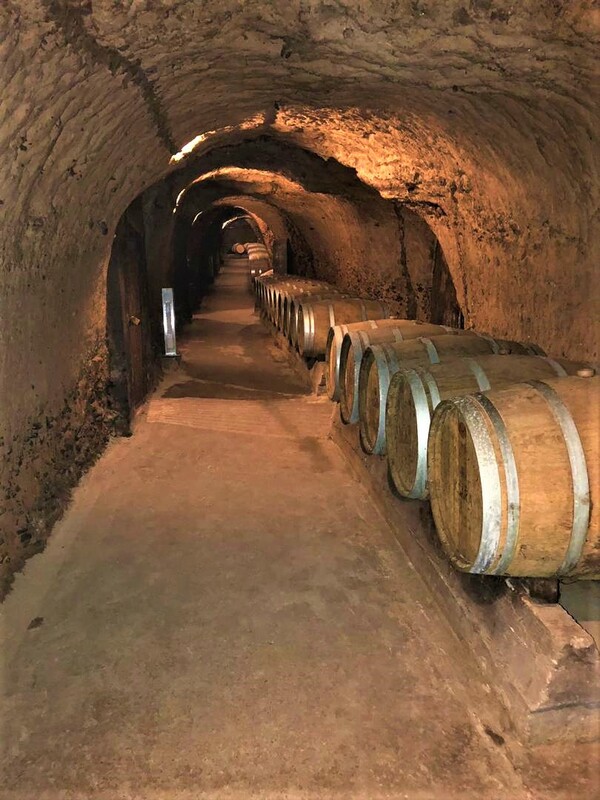 We took a tour of the caves where wines are stored and then had complimentary tasting of several of the wines produced in the winery. On my last day in Lebanon, I decided to visit the oldest continuously inhabited city in the world since 5000 BC, Byblos known locally as Jbeil. Halat is about 10 mins drive from Byblos. I got into a bus headed towards Tripoli and dropped at the Byblos bus stop, from where I took a cab to the Byblos Castle. Byblos is also a UNESCO World Heritage Site and the Byblos castle is a crusader castle also known as the castle of Gibelet. I honestly found the castle underwhelming but not at the same scale as the Tyre ruins, but still underwhelming. The castle gives an aesthetic view of Bylos. After roaming around the castle, I visited the Wax Museum which is spooky but worth the visit. I walked around the museum for a few minutes and headed to the souks. I walked through the souks which was just opening and bought few souvenirs. It was nice to get the middle easterner feel at the souk, this is something that is now missing in Beirut. Activities are sort of limited in Byblos apart from the visit to the crusader castle, wandering around the souks and relaxing by the harbour. I had lunch in one of the many restaurants situated in souks which offered free WIFI. I wasn’t going to leave Lebanon without sighting the Pigeon’s rock in Raouche, Beirut. The iconic 60-meter high limestone twin rocks was formed in the prehistoric era by a geologic movement. I spent hours staring at the rocks, watching the sunset in awe, actually I was passing time until it got dark and just then did I head to the airport. Lebanon is a modern country with blasts from the past which accounts for its allure. Lebanon is the all-in-one type of destination but unfortunately, it is an underrated holiday destination. Unknown to many, Lebanon is home to some of the most fascinating and incredible historic ruins in the Middle East and the world at large. I would encourage anyone intending to visit Lebanon to venture out of Beirut. Thanks Molara for sharing such details of your trip. All your pictures are AMAZING but beyond that, your travel story is so insightful and I learnt a bunch of new stuff. No doubt that if nothing else, the quality of my conversation about Lebanon with people will improve. To plan your trip to Lebanon and any other destination, please contact Molara Brown, who also runs a travel Company, TravelKotroom. Feel free to reach out on her website, Instagram or Twitter.